Posted on Fri, Feb 17, 2012 : 5:58 a.m.
Wtih Paczki Day just days away, local bakeries are ready, lining up secret ingredients and marathon baking sessions, all geared to fulfill promises that they sell the best jelly-filled pastries around. Grocery chains like Meijer and Busch's started advertising the pre-Lenten pastries in mid-February, representing the mass appeal of the deep-fried, filled dough that resembles a donut. Ann Arbor's independent bakers also are seeking a share of the paczki market by distinguishing their products. Marybeth King, Weber's Inn Bakery pastry chef, said the Ann Arbor hotel and restaurant will focus on freshness. Webers' production baker, Jerry Alcenius, even volunteered to come in at midnight on Paczki Day to bake the hundreds of traditional Polish pastries to make sure the freshness is of top-quality for Fat Tuesday customers. "Ours are the freshest you'll find and they're grandma approved," King said. "They are all made from scratch." The Weber’s Inn bakery took advance orders last week for chocolate, custard, blueberry, raspberry, prune and lemon paczki. King said orders will top last year's sale of 600 paczki. King said some will be available for walk-ins starting at 6:30 a.m. on Tuesday. A finished paczki, held by Weber's Inn production baker Jerry Alcenius. Wise Guy’s, located at Packard and Woodlawn, is taking orders for raspberry, custard, lemon, apple and plum paczki. Wise Guys has transformed the landing page of its website into a paczki ordering page. Orders can also be placed in person. Kerry Thompson of Wise Guy's said its secret to what he considers the best paczki in town is the baker. Thompson said the baker's name is considered a secret ingredient, and is guarded closely by the Wise Guy's crew. "This guy is a baker and owns a bakery. He is right there with us making them," he said. Thompson said they sold hundreds last year and sold out by 9 a.m. This year, they are expecting even more customers - and he's excited to see how many they will sell. "It's an exciting time," he said. "Last year was a hit. This year will be even better." Zingerman’s Bakehouse started taking orders in January for the pre-Lenten treat. Sara Richardson, a marketing manager for Zingerman's, said the business had already received more than 600 orders before Valentine's Day and it expects to make more than 1,600 paczki by the time Fat Tuesday is over. Zingerman’s will offer five different types of paczki - raspberry, plum, rose hip, ricotta cheese and chocolate pudding - for $2.95 each. 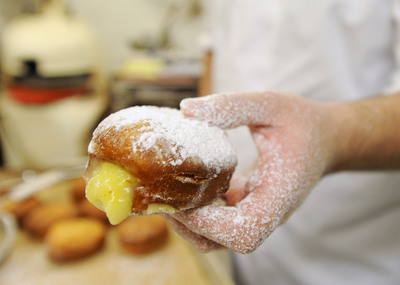 Richardson said last year, the first year the bakery offered paczki, Zingerman's sold more than 1,400 by 11 a.m.
Ann Arbor is particularly gung-ho about paczki. On Fat Tuesday in 2011, Ann Arbor led all regions of the country in Google searches for paczki, according to the search engine's web analytics. Sun, Feb 19, 2012 : 12:47 a.m. Sat, Feb 18, 2012 : 12:31 a.m. I'd have to walk 10 miles just to burn some of those babies off. Fri, Feb 17, 2012 : 5:54 p.m. Shouldn't he wearing gloves. I don't know the health code rules but it doesn't look right. Fri, Feb 17, 2012 : 6:27 p.m.
Other unsterile items? I think it highly unlikely ANYTHING in a bakery is actually sterile. I agree that wearing gloves seems like the prudent thing to do, even if it doesn't formally violate the health codes (which I am not sure actually is the case). Fri, Feb 17, 2012 : 6:02 p.m. The bakers don't need to wear gloves unless they are coming into contact with money or other unsterile items. This article makes me want paczki, but it also makes me think of Ed Vielemetti, formerly of AA.com. He had a detailed list of paczki sources within 50 miles or something, a couple of years running. No links posted under &quot;related content,&quot; but they are still accessible if you search &quot;paczki vielemetti&quot; on this site. Not meant as insult to Mr Shaw. Ed just really got into paczki, I guess! Fri, Feb 17, 2012 : 5:34 p.m. I can never find one who sells the cream ones. Every time I go to get some? All they have is the fruit. Ew. So I gave up getting them. O well, saves me the time and calories. Fri, Feb 17, 2012 : 3:25 p.m.
:babo: is selling paczki as well! That's where I'll be getting mine this year. Fri, Feb 17, 2012 : 3:21 p.m. Okay - I know how to pronounce (and spell) the plural paczki; will someone qualified please tell me how to pronounce the singular &quot;paczek&quot;? Many thanks. Fri, Feb 17, 2012 : 8:19 p.m. Thanks, @a2miguy. From that website it sounds like some sort of hybrid of PAWN-tek (male speaker) and PAHN-tik (female speaker). Fri, Feb 17, 2012 : 7:36 p.m.
Fri, Feb 17, 2012 : 3:22 p.m.
Fri, Feb 17, 2012 : 3 p.m.
Not to throw a wet blanket over your enthusiasm, but &quot;paszki&quot; is a plural noun whose singular form pazcek. Please use it accordingly. Sun, Feb 19, 2012 : 2:15 p.m.
You are correct, but your spelling is a bit off. The singular is p?czek (approximately ponchek; the first vowel is nasal), the plural p?czki (ponchki). Hope that helps. Fri, Feb 17, 2012 : 9:50 p.m. The sheer optimism of this request is astonishing. Fri, Feb 17, 2012 : 6:51 p.m.
however, since no one can eat a single paczski, the point is moot. Fri, Feb 17, 2012 : 6:21 p.m. I am grateful for the information as well, and would appreciate knowing how pazcek is pronounced. Although I am a fan of adhering to traditional use, I think the use of paszki as a singular noun likely is well on its way (if not already there) to being accepted as standard use. Compare, for example, agenda (a plural noun also now used as a substitute for the actual singular form, agendum) and kudos (a singular noun now widely used as a plural). Fri, Feb 17, 2012 : 4:25 p.m.
actually, i appreciate this tidbit of knowledge. thank you. Fri, Feb 17, 2012 : 2:07 p.m. Fat Tuesday means that Summer is just around the corner! Let's Party! Who is selling the organic paczki's? Fri, Feb 17, 2012 : 5:56 p.m. I dont know but I am looking for the fat and calorie free ones. Fri, Feb 17, 2012 : 1:40 p.m.
Copernicus Deli on Main Street is the only place in town worth going to for a pazcki. Get the Rose flavor, the real Pazcki. Fri, Feb 17, 2012 : 8:21 p.m.
What about those available at Amadeus Restaurant? Fri, Feb 17, 2012 : 7:35 p.m. I know, right? I suppose you could argue that this article is about those who actually bake them, and I believe Copernicus ships theirs in from Hamtramck. Still... I'm with ya. Copernicus all the way. Fri, Feb 17, 2012 : 1:41 p.m.
seriously though, how can you write a story about pazckis and leave out the town's best Polish deli? Why did you mention the price at Zingerman's and nowhere else? I had to go to the Wise Guys website to discover their paczkis, at $1.50, are about half the price of Zingerman's.